Has an author ever presented you with a character who captures your imagination only to bring that character’s arc to a conclusion that feels premature? You’re left feeling like there is more to the character’s story. Well, if you go digging you might just find that the author has more to say about that character. Reading an author’s various works can be like putting together the pieces of a puzzle. You might read a novel or a series of novels, and think you have the whole story as conceived by the author. You could very well be wrong. Many writers develop characters, themes, and settings over time with a variety of published and unpublished work before writing a larger novel. Alastair Reynolds, the Welsh author of scifi space opera, is best known for his “Revelation Space” books, a trilogy of future history novels about humanity’s desperate (and I mean desperate) struggle against a mysterious force in the galaxy that is bent on exterminating advanced intelligent life. The trilogy includes Revelation Space, Redemption Ark and Absolution Gap. Nevil Clavain is a pivotal character in the two later novels in the series, an ancient war hero who has lived through centuries of history thanks to a combination of the time-distortion effects of near-light speed space travel, several stints in suspended animation and bioengineering. Clavain is complex. He’s come from a faction of humanity that Reynolds initially presents as menacing and villainous, but Clavain himself is heroic. His character has a lot of back story that is teased out over the course of the novels but a close reading of the book should tell you that this author has spent a lot of time with Clavain. You know that history is there, waiting to be explored, because Reynolds has imbued Clavain with a deep sense of melancholy born out of longevity. Clavain has lived too long and lost too much over the centuries and it weighs heavily on his shoulders. Fortunately, Reynolds has explored Clavain’s universe beyond the major trilogy of Revelation Space. There are two standalone books which Clavain doesn’t figure in as far as I know. But Reynolds has also published a good number of short stories and novellas, and many of them are truly companion pieces to the trilogy. Casual fans will miss them unless they go looking for them. Sometimes an author will use the short story form as the seed for a novel, incorporating the story as a chapter in the larger book. A Home at the End of the World by Michael Cunningham is a good example of this. The New Yorker published his short story “White Angel” in 1988. This tragic coming of age story about the bond between two brothers has a fully formed narrative that in itself is a powerful exploration of fraternal love and profound loss. Cunningham later used this entire story as an early chapter in the larger book, the events in the short story serving as the formative series of events in the life of one of the main characters which drives his actions throughout the novel. 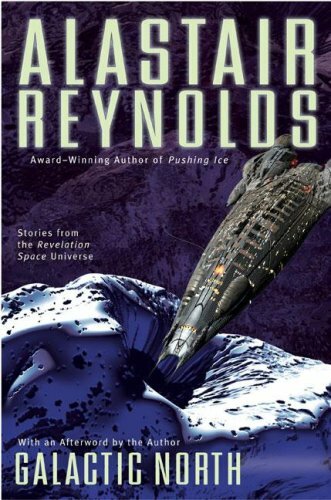 Reynolds, in contrast, has written a variety of short stories and novellas set in the universe he created in his “Revelation Space” novels. These stories explore other aspects of characters and concepts featured in the trilogy and they were written before, during and after the writing of the trilogy. Many of them were collected in Galactic North, which was published in 2006. In this collection you’ll find two stories about Nevil Clavain that take place centuries before the events of the trilogy: “Great Wall of Mars” and “Glacial.” Clavain is already an old man, a war hero who is tired of battle. In “Great Wall of Mars” he sets out on a diplomatic mission to ease tensions between his people and the Conjoiners, the cybernetically-enhanced faction of humanity who have used neural implants to join themselves together in a collective consciousness. Anyone who has read the “Revelation Space” trilogy knows that Clavain ultimately switches sides and joins the Conjoiners. This is the story of how that happens. This is also the story of how he learns to trust the leader of the Conjoiners, Galiana, who doesn’t really appear as herself in the trilogy. But her absence weights heavily on Clavain in the trilogy. He remembers her as perhaps the great love her his life. In this story and in “Glacial,” Reynolds explores the early years of Clavain’s transition into Conjoiner society and the development of his relationship with Galiana. Galactic North also explores some other aspects of the early history of the “Revelation Space” universe and it illuminates the end of the final book in the series, Absolution Gap. I admit that the end of that third book confused me quite a bit. Reading the story eponymous story in Reynolds’ collection, “Galactic North,” helps to clarify some of that confusion, but I’m still parsing through it. Still, reading that story helped me make some sense of the parts of the book which had left me confused. Ultimately I enjoyed reading Reynolds short story collection for the two pieces about Clavain. They gave me the opportunity to spend a little more time with the character and to understand him more fully. So the next time you read a book or books you really enjoy and are left wishing for more to read about the characters and ideas in those books, look around. See what other things the author has written. Maybe he has some short stories published in a magazine or on his website or in some collection that explore other aspects of the characters and places that you loved so much in the original work. You might find it rewarding. This entry was tagged Alastair Reynolds, authors, characters, Revelation Space, Science fiction, short stories. Bookmark the permalink.